Last week, Russell M. Nelson became the new Prophet of the Church of Jesus Christ of Latter-day Saints. His wife, Dr. Wendy Watson Nelson is an accomplished writer and former professor of Marriage and Family Therapy at BYU. The two married, and were eternally sealed in the Salt Lake Temple in 2006, just two years before my husband and I got married. We and the Nelsons share one thing in common – a 26 year age difference. Similar to my situation, this was her first marriage, while this was certainly not his. I too, know what it is like to have advanced degrees and no husband. I used to joke that I had walked down the aisle more times than the average woman – wearing a cap and gown (I’m working on a PhD; so hopefully, I’ll be walking down the aisle one final time)! I finally got married in my late 20’s, so I can’t imagine being in my 50’s and not having found “the one,” as Sister Nelson did. Also like her, I will probably never have children. It’s just not going to happen, barring of course, the Immaculate Conception, which as Mormons, we all know is false doctrine anyway. Marrying a man 26 years my senior was not exactly my plan, but my husband and I love each other very much and have been together now for twelve years. We celebrate ten years of marriage this September. The most difficult part of our marriage has been the misunderstandings it has created, along with the rejection that accompanies it – mostly from family. My family has accepted him – for the most part, but his side is a different story. If I could talk with Sister Nelson, I would ask her questions, such as how she relates to his “children” that are close to her age (or older!)? What do they consider her? – I’m sure they don’t call her “Mom” but she’s not exactly their “step-sister” either. Furthermore, how does she relate to his grandchildren (and great-grandchildren, in his case! ), considering she has never had children herself? Do they call her Aunt Wendy? These are the types of questions that plague me every day in my own marriage. How does it feel not having living Parents-in-Law? I’m sure for many women it would be a blessing in disguise to not have a Mother-in-Law, but for me it hurts not having heard the words “Welcome to the Family” from anyone other than my husband. It’s a rather lonely place to be in and makes holidays difficult when you can’t have a real sense of extended family. In my case, I was looking forward to marrying into a whole new family, but sadly, it’s just not there. As a Mormon, there is the issue of eternal sealing – the proverbial “elephant” in the room nobody wants to talk about. Since President Nelson is widowed, he is now eternally married to more than one wife, which in a technical sense means he’s in a plural marriage. His wife has to deal with this issue too, by default; but at the same time, I would imagine she understood that when she married him. As a Mormon convert, this is also a worry of mine. I do have the advantage of my husband being a non-member, but given the rules, I worry that somebody will come along 110 years later and ruin my celestial honeymoon with an extra sealing. But there is more. 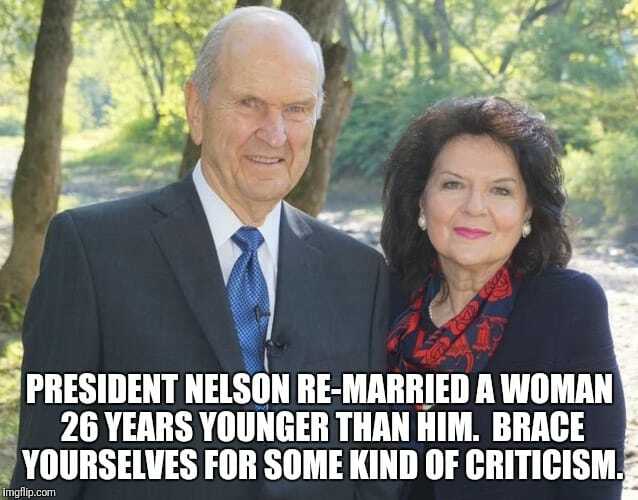 Given the statement made last week by President Nelson concerning a woman’s purpose being tied in with child-bearing, if you think about it, is he really practicing what he preaches? Unless his wife gives birth in the Celestial Kingdom, she will not be giving him children. I wonder how this makes her feel to hear her husband – the Prophet – say something like that! There has to be some cognitive dissonance there, in addition to feelings of failure in this mortal life. I understand, because I deal with these same feelings of inadequacy every time I go to church. There is yet another aspect of this story to consider, and this, in my opinion, has to count for something in the eternal scheme of things. I’ll admit when I got married just shy of 29, I felt like the “Old Maid” in the card game I used to play. I waited an eternity for my husband, at least from my perspective. But I could not imagine being an accomplished marriage and family therapist and having to wait until my 50’s to get married – and being Mormon! However, it would seem to me that in the end, Dr. Nelson got the prize. Not only did she find the man I’m sure she prayed for all those years, but now she is the wife of the Prophet! I believe she waited for God’s timing, and for that she was rewarded greatly. She is now in a place to be an inspiration to Mormon women everywhere – she is what I would call a church “Matriarch” in the truest sense with a lot of influence. While I will never be wife of the Prophet – or even wife of a “Priesthood Holder” (thank goodness! ), my husband and I have shared our own uniquely profound spiritual experiences (some of which I have shared in previous posts). I believe many of these experiences occur due to his noteworthy Hebrew lineage, of which I personally don’t share. For me, being the lowly “Ephraimite” I am – and an ex-Baptist, at that – I’m not quite sure what I did to deserve these spiritual experiences, but I am thankful for them. Every day. While my prayers for a “goodly” husband were honored, some days the loneliness and disconnect we feel in our marriage is so unbearable, at least it is for me. And yet, we still have each other. Between the two of us, there is a lot of love there. I ask myself all the time why I just can’t be happy with that? I often wonder if I made some kind of compromise in the Pre-existence in order to be able to share in these spiritual experiences with him? I guess I will never know. That said, I am so thankful for my knowledge of my Mother in Heaven, and nobody can ever take that away from me. I should be thankful every day and not “wallow” in self pity. But how many of us, if we are honest with ourselves, have dwelled in self pity due to feeling misunderstood, even in the midst of our many blessings? It is sometimes difficult to see our own blessings when they are different from the blessings of those around us. But that proves my point. We never know God’s plan, and God’s ways are not our ways. I believe the same goes for the Church and our unrealistic expectations towards other members who do not fit our preconceived notions of “worthiness.” I recently had an experience where I wrongfully judged someone who is not a member of our church – and the Holy Ghost let me know it in a very real way. At the same time, I have felt misunderstood many times over by church members and non-church members alike. We need to forgive and try our best to move on. Nobody is perfect; everyone makes mistakes. Each situation is different, and in the end, our Heavenly Parents are the only ones who have the divine right to judge. That said, I’m convinced LDS May-December romances can be a beautiful, eternal mess, but now my husband and I have an example within the Church leadership to look up to. I no longer need to be ashamed of my own circumstances at church because the Prophet’s wife is in a very similar situation to that of mine. This for me is a great comfort. While I understand many progressive Mormons were upset on the day Nelson was installed, I had my own personal reasons for rejoicing. 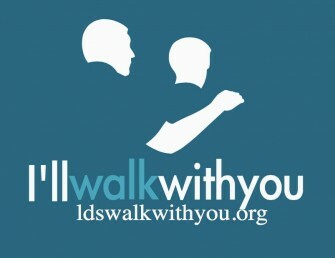 This does not mean I support everything President Nelson stands for – I most certainly do not! – but it means that I have hope that my own eternal mess of a marriage can be blessed by our Heavenly Parents in a very special way. My goodness me…a lowly Ephraimite, and talk of Heavenly Mother…as far as I know, nowhere is Heavenly Mother mentioned in LDS scriptures. Why do you feel inclined to put yourself down? The only one putting someone down is you. What Do the Scriptures Say About Our Heavenly Mother? One of the most unique and beautiful doctrines of the Restoration is the truth that we have a Mother in Heaven. Although we don’t yet know as much as we would like to know about her, we are blessed to have a knowledge of her existence and a basic understanding of her divine nature and essential role in the Plan of Salvation. As we faithfully study what has been revealed about her, the Spirit will confirm to each of us the knowledge we sing about in our hymn, that in heaven “I’ve a mother there” (Hymn 292). In October 2015, The Church of Jesus Christ of Latter-day Saints published an official essay surveying the history and summarizing the doctrine regarding our Mother in Heaven. This was exciting because, although it was a doctrine that had been believed and discussed since the days of Joseph Smith, it had never been summarized in an official statement before. This essay showed that it was not a speculative or fringe doctrine that we should avoid but a doctrine meant to be understood and believed by the mainstream of the Church. While the official essay chronicles many of the key statements by church leaders, the purpose of this article is to show what the scriptures say on this important doctrinal topic. One scriptural source we can turn to for information about our Heavenly Mother is the book of Abraham. Critics of that book try to attack its divine origin by questioning Joseph Smith’s inspired translation, but as Jesus Christ explained “ye shall know them by their fruits” (Matt. 7:16). What this means for the Book of Abraham is that the greatest evidence that it is an inspired book of scripture is not found in arguments about its historical origins, but in the many divine truths it reveals. Among these many truths is the beautiful and inspired doctrine of our Heavenly Mother. The book of Abraham adds to our understanding of our Heavenly Mother by revealing her role in the creation. In the book of Genesis, our knowledge of who participated in the creation is limited to the classic introductory verse: “In the beginning God created the heavens and the earth” (Gen. 1:1). The book of Moses adds to this by revealing that God sent His Only Begotten Son, Jesus Christ to perform the work of creation (Moses 2:1). But the book of Abraham reveals even more by explaining that Jesus Christ did not work alone, but was assisted by “the Gods” (Abr. 4:1). 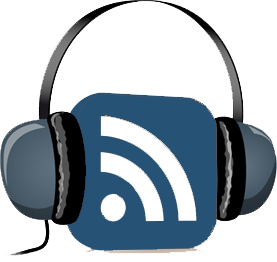 In the previous chapter, “the Gods” are identified as “the noble and great ones” (Abr. 3:22), whom Jesus Christ invited to assist him in the creation. “We will go down,” said Jesus to these valiant pre-mortal spirit children of God, “for there is space there, and we will take of these materials, and we will make an earth whereon these [spirit children of God] may dwell” (Abr. 3:24). Presumably they are called “Gods” because they have inherited that title as the children of God. Jesus Christ and these noble and great spirits were sent by our Heavenly Father to create the earth and everything on it. Everything, that is, except man. As Elder Bruce R. McConkie has explained, Heavenly Father “used the Son and others to perform many of the creative acts, delegating to them his creative powers … But there are two creative events that are his and his alone. First, he is the Father of all spirits, Christ’s included; none were fathered or created by anyone else. Second, he is the Creator of the physical body of man. Though Jehovah and Michael and many of the noble and great ones played their assigned roles in the various creative events, yet when it came time to place man on earth, the Lord God himself performed the creative acts” (A New Witness for the Articles of Faith p. 63). Interestingly however, when the book of Abraham describes the creation of man it states that “the Gods went down to organize man in their own image, in the image of the Gods to form they him, male and female to form they them” (Abr 4:27, emphasis added). If Jesus Christ and the noble and great ones did not assist Heavenly Father in the creation of man, then why does it say “the Gods” rather than simply God? Who was the other God that created us with our Heavenly Father? When we understand the doctrine of Heavenly Parents, the answer is clear. This verse is one of the few scriptural references of our Heavenly Mother and it shows that she, along with our Heavenly Father, is our creator. Our Heavenly Father and Heavenly Mother, “the Gods” as they are called in this verse, joined together to create all of us as spirits, and again to create the physical bodies of Adam and Eve. This interpretation is confirmed by an official statement by the First Presidency, which states that “all men and women are in the similitude of the universal Father and Mother, and are literally the sons and daughters of Deity. ‘God created man in His own image.’ This is just as true of the spirit as it is of the body” (The Origin of Man, 1909 republished in February 2002 Ensign). This is also supported by the Family Proclamation, which states that, “All human beings—male and female—are created in the image of God. Each is a spirit son or daughter of heavenly parents, and, as such, each has a divine nature and destiny” (The Family: A Proclamation to the World, republished in Nov. 2010 Ensign). If you are not able to bear children right now, in this life all is NOT lost on that one. The Millennium will offer ample time for that to be carried out.